Oil prices continue to decline on oversupply concerns as crude inventories increase to their largest level since last December. High production comes as the demand outlook weakens on the back of a global economic slowdown. However, a weaker US Dollar in addition to a threat from OPEC to start withholding supply in 2019 might help in containing the decline going forward and might even trigger a reversal. 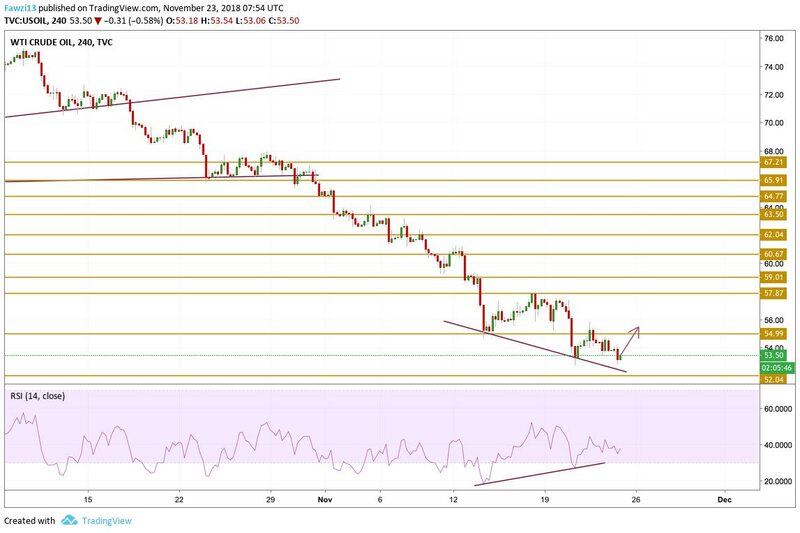 As expected, Crude prices tested and found support along the $52 to $53 area while the divergence between price and momentum remained flagrant pointing towards a correction for the black gold. The price is currently hovering just above the $53 level targeting the $55 resistance level as the RSI looks bullish.